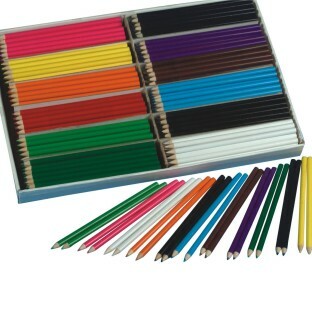 A total of 240 full sized 7” colored pencils in 12 of our most popular colors. Pack includes 20 each of 12 bright colors: Red, Orange, Yellow, Purple, Green, Light Green, Blue, Light Blue, Brown, Black, White and Pink. Great for your budget and all your coloring/drawing needs. Works best on smooth surface papers. Non-toxic. TONS OF COLORS AND LOTS OF EACH. GREAT FOR GROUP COLORING! We are replacing the national brand with these in all our classrooms. Nice quality easy to sharpen. Art time at day camp. Good color choices and pigment quality. Sharpens and colors easily.